CHICAGO — Year-over-year coin laundry sales for the month of October were up across the country, on average, according to results from this month’s American Coin-Op StatShot survey. Leading the way was the South, where sales were reported to have been up 6.5%. 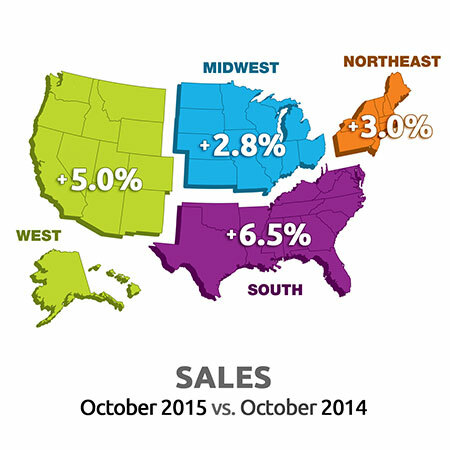 Not far behind was the West, where October sales were reported 5.0% higher than those of October 2014. Store owners in the Northeast and the Midwest also posted increases in October year-over-year sales, up 3.0% and 2.8%, respectively. It marked the eighth straight month that sales have been higher (or, in the case of one region in June, unchanged) when compared to the same month the prior year. Operators in the South charged the most for their dryers, as the average price there in October was 39.7 cents for 8.5 minutes, compared to 27.7 cents for 5.9 minutes reported in last year’s survey. Drying times among the region’s respondents currently range from 5 to 25 minutes. In the Midwest, the average dryer price in October was 32.3 cents for 8.1 minutes, compared to 39.9 cents for 10.1 minutes in October 2014. Current drying times range from 5 to 14 minutes. The average dryer price in October in the West was 27.5 cents for 6.6 minutes. That compares to 25.0 cents for 8.8 minutes in last year’s survey. Drying times among the region’s respondents currently range from 5 to 8 minutes. Operators in the Northeast reported the lowest current average dryer price among all regions, at 25.0 cents for 7.9 minutes, compared to 27.7 cents for 7.6 minutes in October 2014. Current drying times range from 6 to 12 minutes. The unscientific StatShot survey includes information on sales, wages, costs or other financial data based on survey information provided anonymously by vended laundry store owners. American Coin-Op audience members are invited via e-mail to participate in the surveys, which are conducted online via a partner website. All self-service laundry owners/operators are encouraged to participate, as a greater number of responses will help to better define industry trends.